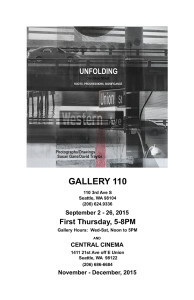 An edited version of the exhibition seen at Gallery 110 September 2015 is at the Central Cinema in the Central District of Seattle. This theatre with exhibition space and a restaurant shows older films and alternative media. The Central is on 21st and East Union in an area of small businesses and a residential neighborhood. The Unfolding book made by David Traylor who did the drawings has been adapted to hang in this space. All the photographs are by Susan Gans. 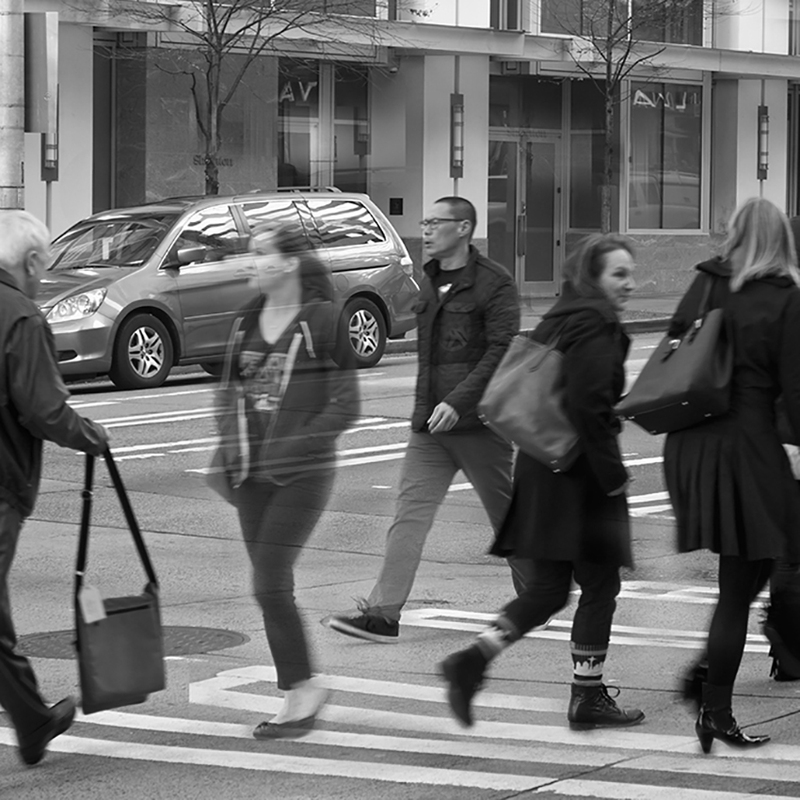 This project is an investigation of Union Street… the physical changes and visual impact of these… from Elliott Bay in the commercial core of the city to its ending at Lake Washington in the Madrona neighborhood. Poster for Upcoming Exhibitions. Composite Image and poster made by Susan Gans. Union Street between 4th and 5th Ave in Seattle. Woman in the shadows crossing in between the others is the Witness to the realities and mysteries of the street and is invisible to the others. This image is part of the May 2015 exhibition at Martyr Sauce… The No Mountain Show. 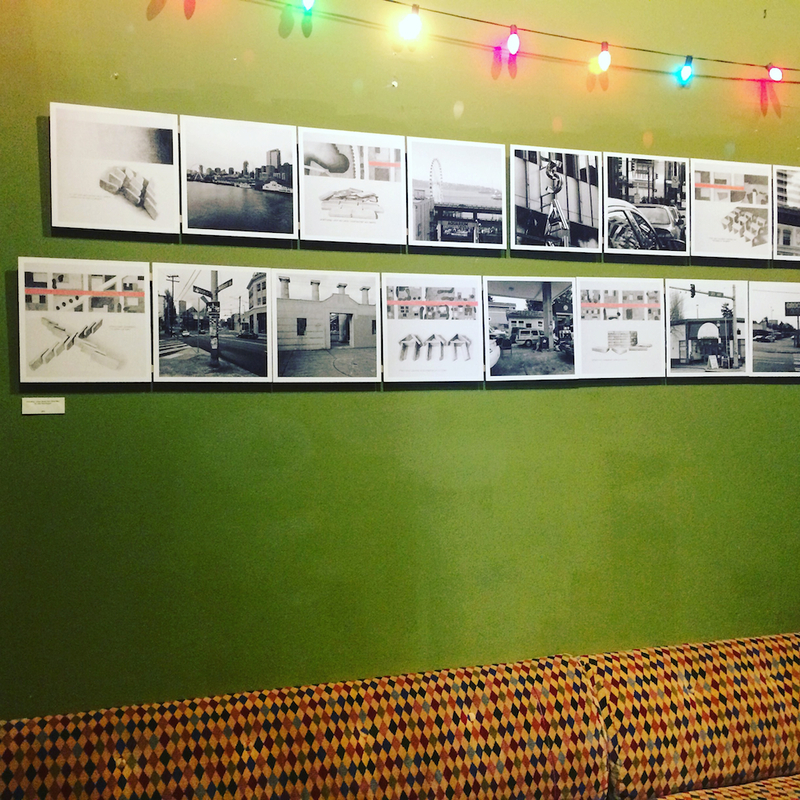 Currently, I have work from the Memory and Identity Project in an exhibition at Gallery 110, in Seattle. Outside Looking In was curated by George Brandt. 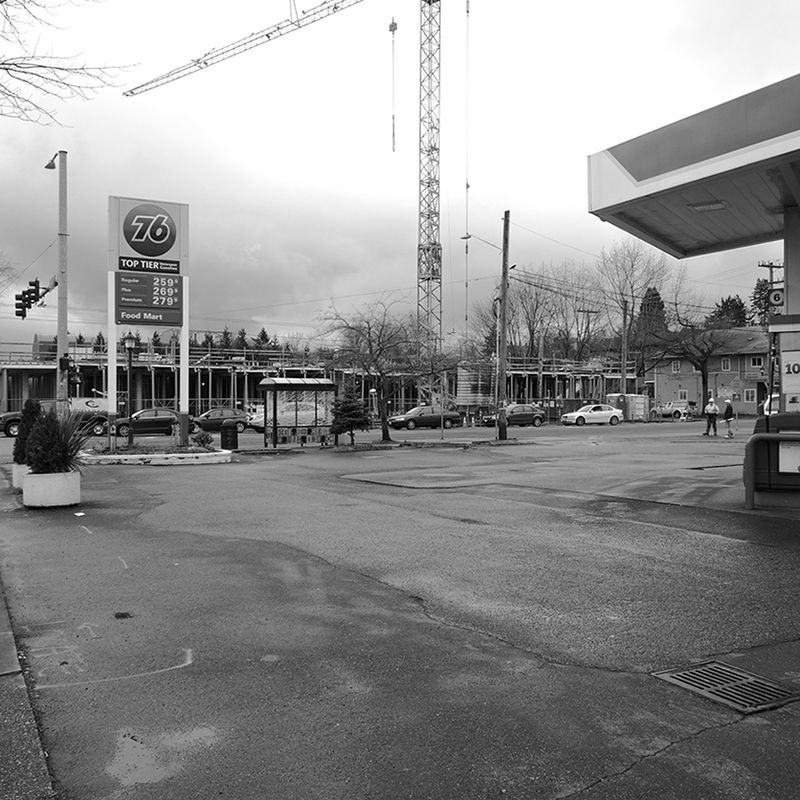 Three images about the inner urban world are in a show at Martyr Sauce, Seattle, WA until June 30, 2015. This exhibition called, The No Mountain Exhibition was curated by photographer Shannon McClatchey and Tariqa Waters, Director of this gallery. Six images are part of the exhibition, Environmental Art, curated by June Sekiguchi, at the Ida Culver House (Broadview) in Seattle, WA. This exhibition opens May 18th. From May 30th to June 27th, three images will be part of the exhibition, This Is Who We Are at the Clarridge Gallery, Bellevue, WA. This exhibition is curated by the photographer, David Koronthaly. For many months, I have been working with David Traylor, a sculptor, painter and landscape architect, to wrap up a 5 year collaboration looking at the meaning of “place” from an architectural, cultural, economic and social point of view. This latest project is about one street, Union Street in Seattle, from Elliott Bay at its western border to Lake Washington on its east side. This street has always brought back memories of other places I have lived because of its artistic richness, community-centered neighborhoods, activism and diversity. The 76 gas station will be going away in the foreseeable future. Meanwhile, a mixed use building is on the rise. This intersection is ungoing profound changes. The identity of the Central District’s African-American population has been important to this area. The future is still unknown. Union Street and downtown Seattle… on the Western Side and Elliott Bay. Up the stairs from here leads to the commercial and cultural district to the Seattle Art Museum, Benaroya Hall – home of the Seattle Symphony, Triple Door for Jazz, Blues and more, various clubs on up to ACT Theatre and the Convention Center. has brought us in contact with artists, developers, small business people and residents who care deeply about their street. We are in the process of making photo sketches and/or drawings, mock-ups as we begin to get ready for the final 3 months of creating the actual exhibition to be seen at Gallery 110 in the Tashiro-Kaplan Arts Complex in Seattle this September. IT IS NOW SEPTEMBER AND UNFOLDING IS OPEN. THE EXHIBITION INCLUDES A 24 FOOT BOOK OF DRAWINGS AND PHOTOGRAPHS ON 12 INCH X 12′ INCH PANELS. 17″ X 22″ PHOTOGRAPHS IN COLOR AND BLACK AND WHITE AUGMENT THE BOOK. 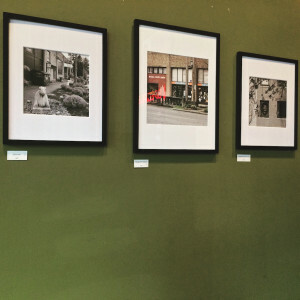 CHECK OUT: www.gallery110.com and Instagram/ gallery110. Received notification that Mortality Tales has been accepted into the 9th Annual Juried Exhibit, selfie: here & now, at Columbia City Gallery in Seattle. This exhibit opens September 24th and closes November 16, 2014. Hosting at the photography organization, f/5.6 on August 27 and introducing Gene Dwiggins, a fabulous photographer who will speak about his unusual large scale photo mosaics. Am a member of Gallery 110 in Seattle so am making a pitch about the next Juried Exhibition that brings together works annually from an international group of artists to be reviewed by a major curator, gallery or museum director or established artist. This year, the Juror is Scott Lawrimore who recently was named the First Director of the University of Washington’s Jacob Lawrence Gallery. Entries are due: October 22, 2014. See www.gallery110.com for more information. Use www.callforentry.org to upload images and pay the $35 fee. Have question? Email juried show@gallery110.com. You never know what will happen… There are cash awards for first, second and third place winners. 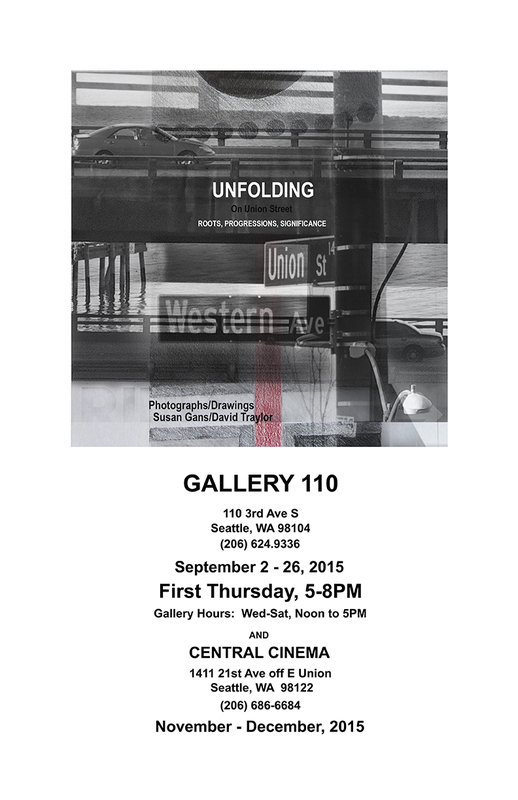 I am pleased to be back at Gallery 110. In 2002, I became one of the original members and had several shows there between then and 2007. In July, I will be showing new work from the project, Seer of Secrets. Examples are in the gallery part of this site. 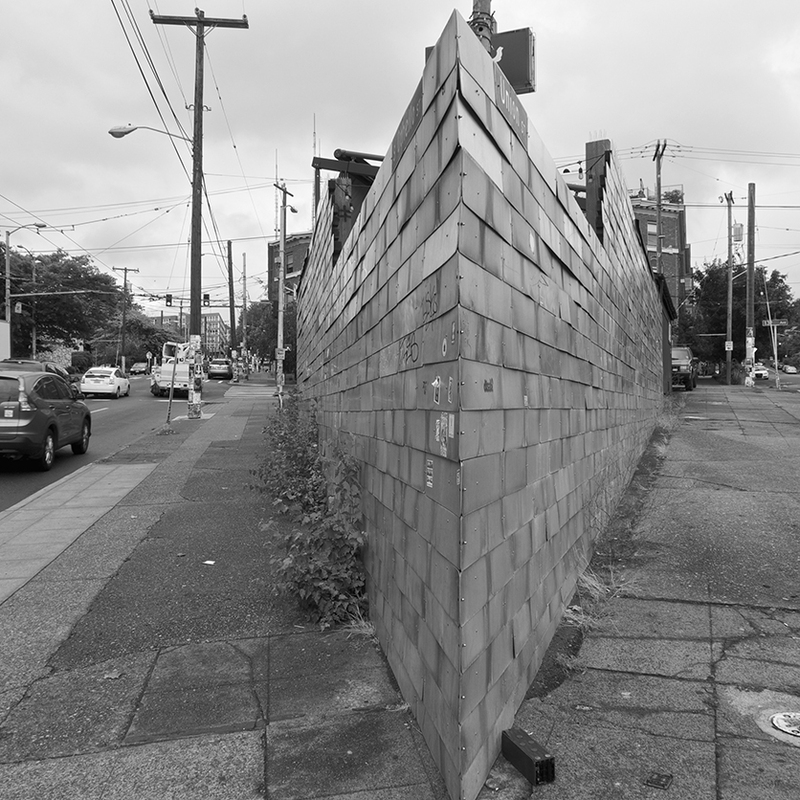 This work explores neighborhoods in transition that have history and are firmly rooted in this city. I have made composites from multiple images and also included original haikus that refer to the issues and concerns explored. 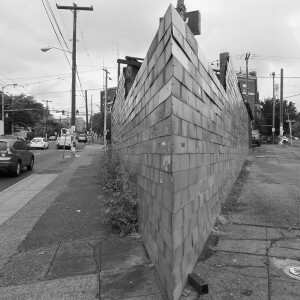 This gallery will continue to grow as Seattle goes through its transformations. Should you wonder why I have included an image of my face in each of these composites, it is because I am serving as the symbol of the people who are and will be affected by the changes in their neighborhoods and structure of the city. I am their witness to these events but also have taken the liberty to create work with stories that have a universal theme. There are two other artists in the show Altered Landscapes/Fractured Lines. The dates are July 3 – August 2, 2014. On August 2nd, the Tashiro-Kaplan Arts Complex will have its 10th anniversary celebration. There are live-work units, galleries and studios in this building. Many events are planned for that day. The original Red Current exhibition was curated by Sharon Arnold and was shown at Roq La Rue Gallery in March 2012. The common denominator was that all the participants were women. No other restrictions applied . A list of artists from that show is on the site. This time the updated project is web-based and growing daily. The statement by Sharon Arnold gives the context for both segments. I am pleased to be represented in the “New” Red Current. The website is: www.redcurrentseattle.com. The site is also listed under Links/Organizations. I invite you to take a look at the richness and diversity of work shown by Red Current from women in the Greater Seattle community. Currently, I have 30 images completed over the past several years at the Elliott Bay Public House Brewery in the Lake City neighborhood of Seattle, WA. The theme of this show is “KEEPING AN EYE ON MY WORLD AROUND”. The images have been selected from all the galleries on this site except for Memory and Identity. A photomontage, “I know you, I know you When” was accepted into the Artist Trust Auction in Seattle, Washington by a distinguished group of museum and gallery jurors. 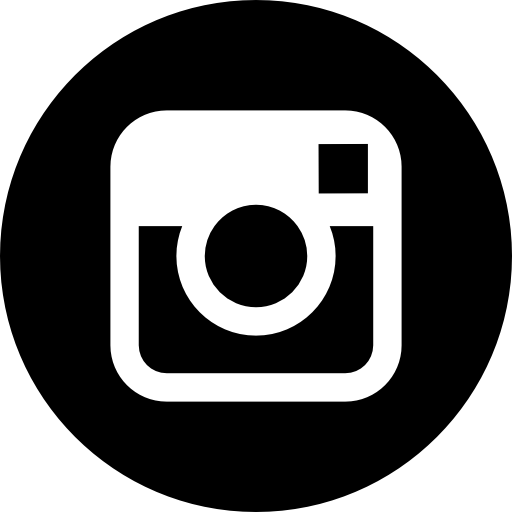 Artist Trust is a non-profit organization that supports the efforts of individual artists in Washington State. This image is in the Narratives gallery on this site. Work also traveled to Portland, Oregon recently and then was seen at venues in the Seattle area. Different projects are being developed in 2014 including another collaboration with David Traylor, a Seattle Sculptor and Painter. Projects with David always concentrate on some aspect of defining place. This one will be no different. More to come. This year it is time to return to printmaking and alternative photography. I have ideas churning and will post once work is started. Using the concept of BEING THERE for the exhibition title, a body of much new work will be at the Hanson Scott Gallery from October 2-November 2, 2013. 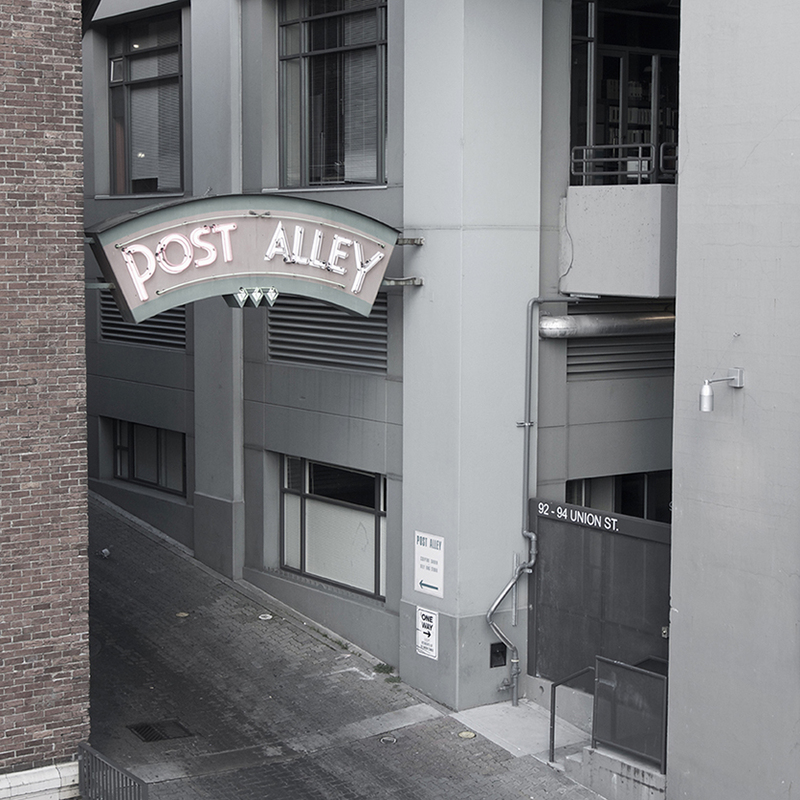 This gallery is in Seattle’s historic Pioneer Square. For those of you in the Puget Sound area … it is at 121 Prefontaine Pl S, Seattle 98104. The gallery is open Wednesday-Saturday from 11-5. First Thursday is the traditional Seattle ArtWalk and the gallery will be open along with all the art spaces in that area from 5-8pm. Also on October 26th, there is a reception from 5-7pm. Please visit. 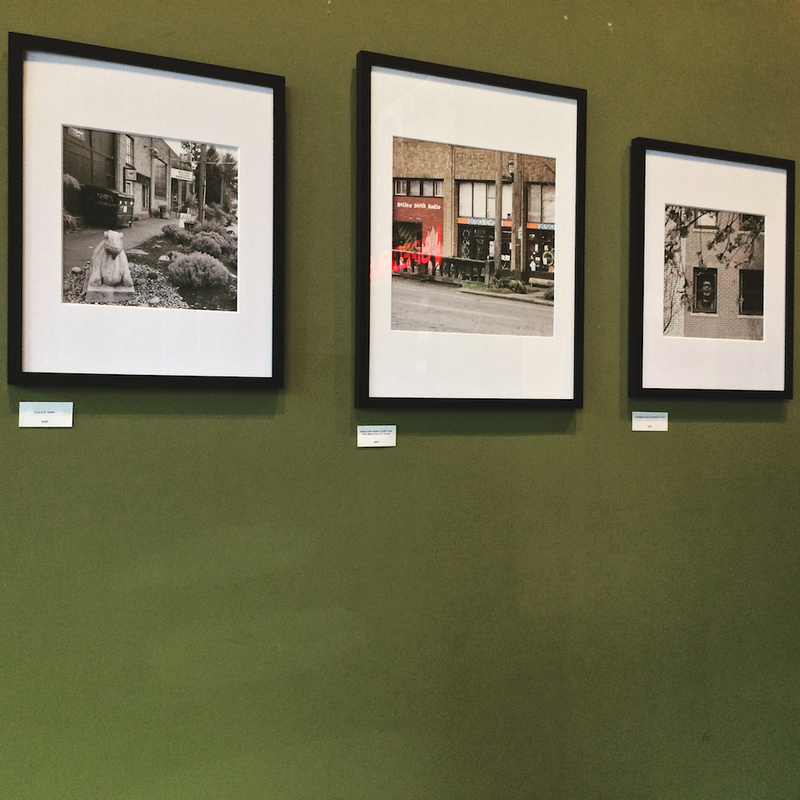 Also showing with me is Glenn Hudson whose work is both color and black/white, darkroom and digital. BEING THERE has been organized into series of images that relate in subject matter, context or as an idea. Most of these scenes are one from our daily lives but the details pass us by as do the connections to other like events. The gallery part of this site called Being There was created as a place for landscape and structures to be viewed. Within the gallery the same idea exists as with the exhibition… there are similarities and contrasts that result in a connection between events that may be at different locations but are relevant to a core idea. Also, I have work at the Collins Pub on Second Ave between James and Yesler Streets. This venue has been showcasing art for several years. 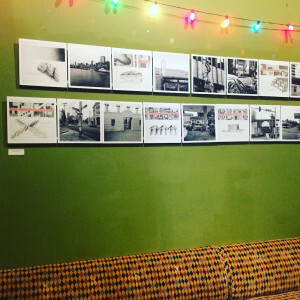 Brian Lane has curated a show of Photographs that show a broad range of technique and subject matter. Other artists in this show include: Brian Lane, Christian French, Not Jennifer Zwick, Daniel Carrillo, Nichole DeMent, Dennis Raines, Jeff Mihalyo and Bill Finger. I am delighted to be part of this incredible group known for their unusual viewpoint and experimental techniques. This show will be up through November. I also have two images at the City of Sea Tac Community Center included in the Annual Photographic Competition on view from October 1-25, 2013 as well as an image in the NEWSPACE NOW: 2013 Members’ Salon & 11th Anniversary Celebration. This show was curated by Chris Bennett, the Director. Newspace in Portland, OR and is open 7 days a week. It is located at 1632 SE 10th Ave., Portland 9714. The website has been somewhat updated but more changes will come shortly. Enjoy! Construct Abstract was selected as one of 40 works to be included in a show juried by Linda Hodges from the Linda Hodges Gallery in Seattle for the 2013 Kirkland Artist’s Exhibition in Kirkland, Washington. 200 images from 97 artists were entered so I am especially delighted to have work included. This exhibition opens June 7, 2013. Fence Line will be part of an exhibition at the University House in Seattle, Washington. This show opens mid June and will run into the Fall. June Sekiguichi, Curator, Artist and Co-Director of Method Gallery in Seattle selected this work. Both images are on the Place/Landscape gallery.